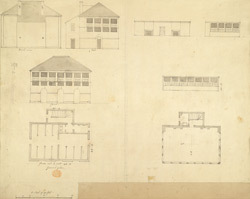 Eight architectural drawings of a house at Newmarket on the Suffolk/ Cambridgeshire border. These include front and side elevations, sections through the buildings and floor plans. By the late 18th century horse racing was well established at Newmarket. There were royal racing stables established here and a royal palace, and monarchs since James I had taken an interest in the town. The flat open spaces of Newmarket Heath were ideally suited to a racing ground. In 1752 a London gentleman's club called the Jockey's Club established their headquarters' here.